How Much Will It Cost To Fix A Small Dent In My Car? At PDR 2U we are often asked questions like “how much will it cost to fix a small dent in my car?” or “what will it cost to repair some light hail damage on my vehicle?” Answering these questions is a bit like answering the age-old question “how long is a piece of string?” The reality is, questions like these are impossible to answer without viewing a photo of your dent, or in the case of hail damage, physically inspecting your vehicle. There are many variables that can have a significant impact on the cost of the dent repair on your vehicle. 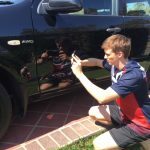 Every dent repair is different and as a result, the cost to repair your dent may be quite different to a similar dent on a different vehicle. At PDR 2U, we only charge you for what you needs to be repaired and nothing more. Feedback from our customers regarding our prices is always consistent. They are always happy with the quality and cost of our repairs. As a PDR2U customer, you can rest easy knowing that because we don’t have a one price fits all policy, you will not be paying too much for your repair. 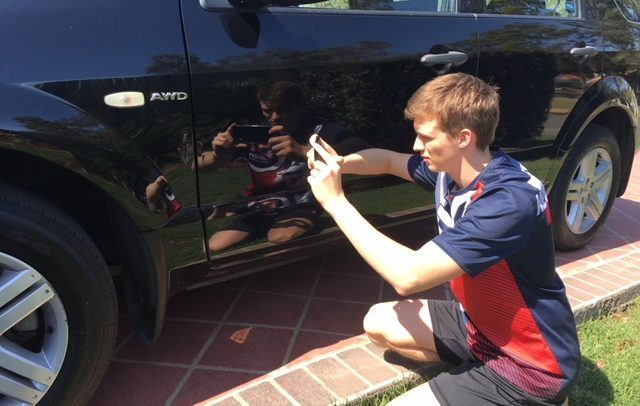 Photos taken on a 45 degree angle (like the one below) to the panel are best, as they allow our paintless dent repair specialist to accurately determine the size and depth of the dent. Our experienced dent technician will assess your damage and provide a competitive quote based on the criteria above. The best way to reduce repair costs for hail damage to your vehicle is to prevent the hail damage from happening in the first place. While it is not always possible to have your vehicle tucked up safely in a garage at home when a hail storm hits, there are a few things you can do to reduce the risk of it being damaged. There are also a few myths out there about how to stop hail stones damaging your car, and it may be difficult to determine which are true and which will leave you with a car full of dents. When at home or work, the safest place to park your car is in a closed garage or in an undercover carpark. Carports also offer some protection, but if they have open sides, strong winds have the capacity to drive hail stones into the sides of your vehicle. One myth that we hear all the time is that parking under trees will protect your car from damage during a storm. While this may seem like a good alternative to storing your car in a garage, heavy storms with strong winds and hail stones may cause branches and other objects to fall on your car, causing extensive damage. Another myth that we regularly hear is that placing a blanket over your car or covering it with mats or pillows will stop hail damage from occurring. As a last resort, a thick blanket may provide some protection against small hail stones, but larger hail stones will still leave your car dented. Unless they are tied down securely, they can also be blown away. Padded hail covers can also be purchased, which offer protection in a similar way to a blanket, but the level of protection they offer will depend on the type of cover purchased and the size of the hail stones. In Brisbane and Gold Coast we can get some big hail and this often results in a lot of damage being done. Due to the unpredictable nature of hail storms in and around the Queensland area, there is always a risk of being caught out unprepared. If this happens, you could park your car as close as possible to a building, but remember to park on the opposite side of the building to the approaching storm. By doing this, hail may hit the building, but winds from the storm may blow the hail straight over the top of your vehicle. Other places to look for protection when caught driving in a hail storm could include a service station shelter, a shopping centre carpark or under a bridge. If these options are unavailable, find a safe place to stop on the side of the road until the storm has passed. You may be left with hail damage, but a moving car can not only be unsafe, it can also increase the extent of the damage when the impact of the hail is compounded with the speed of the moving car. One final, yet very important, point to bear in mind is to always put safety first. Never put yourself or others in danger in an effort to protect your vehicle. Panels can be repaired, but people can never be replaced. If you find yourself with a hail damaged vehicle, give Wayne from PDR 2U a call on 0448844328. 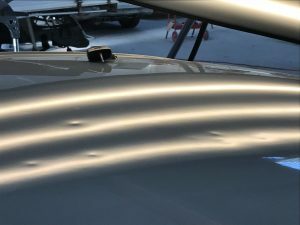 If you have one hail damaged vehicle or hundreds, our team at PDR 2U can have the damage repaired quickly and efficiently, with a lifetime guarantee on all paintless dent removal repairs. Whether it be an insurance repair or a private job, customer satisfaction is our number one priority. Many people underestimate the damage that can happen to their cars by hail storms. This Volkswagen Golf was damaged in a recent storm affecting Brisbane and surrounding suburbs. It caused a lot of vehicle dents due to impact from multiple hailstones. When combined with strong winds, hailstones can cause dents in nearly every panel of a vehicle, as was the case with this Golf. Using traditional panel beating techniques, a repair of this size would have been very costly and left the customer without a car for many days, if not weeks. Bogging and re-painting the panels would also mean that the factory paint would not have been maintained, reducing the quality of the car’s finish. Fortunately, the owners of this vehicle had their car repaired by PDR 2U. 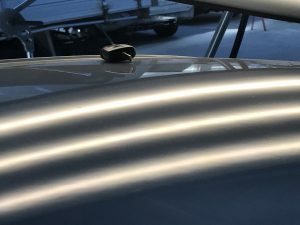 They had peace of mind, knowing that all paintless dent repairs were carried out using efficient and cost effective dent removal techniques that maintained the high quality factory paint finish on their vehicle. They were also pleased to hear that they had a lifetime guarantee on all of their PDR 2U dent repairs. Due to work commitments, this customer also had significant time constraints and could not be without a car for a long period. As a result, PDR 2U was able to work in with the customer’s busy schedule and had the car restored to its original condition in less than 48 hours. There are NO visible dents and the paintwork is completely undamaged. This quick repair time meant that the customer was able get on with his life with minimal interruption. If you have any enquiries about hail damage dent repairs or need an insurance quote for your private or fleet vehicle, call us on 0448 844 328 to talk to one of our professional paintless dent repair technicians.